Program cover from 2013 APS DFD Conference. 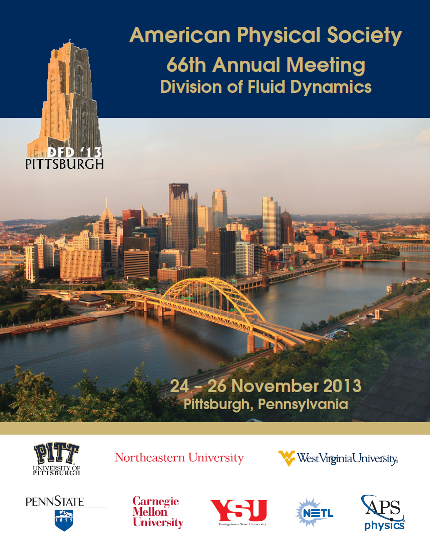 After three busy days (and a hiatus for Thanksgiving), the American Physical Society Division of Fluid Dynamics conference (APS DFD) in Pittsburgh, PA has come to a close. Over 2,700 attendees braved the wintry weather to come and share their work on a wide array of topics ranging from microfluidics to turbulence modeling and everything in between. This was the first time Pointwise has attended the conference, and we were very pleased with the number of people that dropped by to learn about our capabilities or ask technical questions. The DFD conference provides a fantastic forum to discuss cutting edge results from theory, simulations and experiments for any and all things pertaining to fluids as the attendees come from a very diverse background including biology, chemistry, engineering, and physics. One of the aesthetic highlights of the conference is the gallery of fluid motion, which is a collection of submissions that visually highlight the striking nature of fluid phenomena. Along a similar vein, in addition to presenting her technical results on hypersonic boundary layer transitions, Nicole Sharp gave a talk on lessons learned from her website. Her outreach talk was extremely well attended (one of the most-packed rooms I’ve ever seen in four years at this conference), and the fluid dynamics community seems to be very supportive of the work she is doing to share fluid dynamics with the general public. CXR 80 Bicycle wheel for triathlons and time trials. I personally attended a few technical talks which caught my eye, including one very interesting presentation by an engineer from Mavic on the aerodynamics of bicycle wheels. 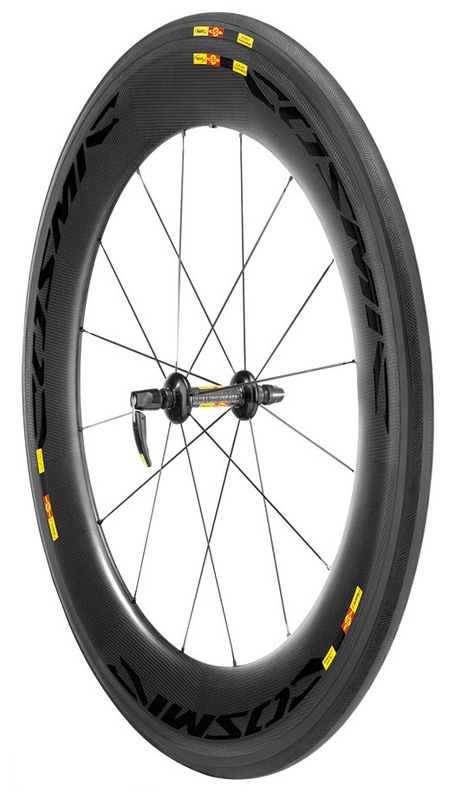 Mavic is a French company that is a provider of wheels for professional cyclists—they were the official provider for several teams at the London Olympics and provide the wheels for Team Garmin in the Tour de France. Although the frontal area (and subsequent drag) of a cyclist is dominated by the rider, the wheel has very interesting behavior when exposed to cross-winds. Through a combination of simulation and wind tunnel testing, Mavic concluded that they could achieve a “sailing effect” when the apparent wind over the wheel exceeded 14 degrees relative to a direct headwind, greatly reducing the drag of the wheel, and in some cases producing a small amount of thrust. This was achieved by carefully crafting the rim of the wheel to act as an airfoil. A short video of the product development can be seen here. Crash course in dynamo theory! Another talk that I attended was given by from Daniel Lathrop from the University of Maryland, who discussed some initial experiments on a three meter spherical Couette device filled with liquid sodium. This experiment consists of a small sphere located at the center of a larger sphere. The inner and outer sphere can be rotated differentially, resulting in vastly different dynamics depending on the relative direction and rotation rates of the two walls. Think about that for a second. This experiment is a spinning sphere that is nearly 10 feet in diameter filled with molten sodium. If you recall from high school physics, pure sodium is quite hazardous as it will explosively react with water. Needless to say, this is an ambitious experiment. 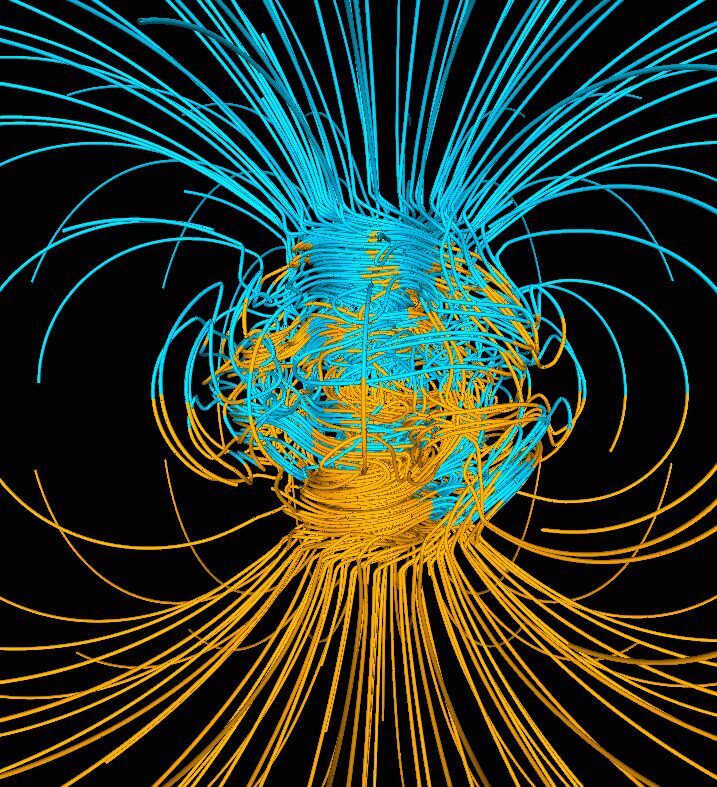 Simulation results showing the creation of Earth’s dipole magnetic field via dynamo action. The spherical Couette experiment is designed to study something called the dynamo effect, which is believed to explain the production of Earth’s own magnetic field. In this case, the working fluid was chosen in order to maximize a quantity known as the magnetic Reynolds number (replace kinematic viscosity with magnetic diffusivity in the definition of Re). The dynamo effect requires a high magnetic Reynolds number, which can be shown to imply the fluid motion will twist existing magnetic field lines. It is believed that this twisting of the field lines results in a feedback mechanism that results in the net production of internal currents which in turn increase strength of the background magnetic field. I happen to know of other groups studying the same phenomenon using different approaches, but I have to admire the ambition of constructing and operating an experiment of that size. This set of lecture notes by Dieter Schmitt from the Max Planck Institute contains more information on dynamo theory, for those of you who are interested. Not really, but I did present some of my own work from my days at Princeton. In particular, I discussed the physical basis for the behavior observed in the thermal evolution of flowing liquid metal as a function of magnetic field. For a magnetic field transverse to the flow (illustrated in the inset in the figure below), the temperature measured at the bottom of the channel would decrease for low applied fields, and then increase after the applied magnetic field strength crossed above a particular threshold shown by the vertical dashed line in the figure below. The location of this minimum is given by the ratio of electromagnetic forces to inertial forces crossing above unity. Essentially, this plot shows the suppression of heat transfer by damping three-dimensional turbulent structures at low fields and coherent structures promoting heat transfer at high magnetic fields—the key result I experimentally verified in my work, albeit much more comprehensively than a single plot can demonstrate. Ahh! Data! Do not be alarmed, this is only for discussion purposes. Unfortunately, I did not have the chance to attend these talks personally, but there were three invited speakers in particular that caught my attention. The first, Michael Brenner from Harvard University, spoke about “Fluid Mechanics of Fungi and Slime”. The premise of this talk was that there are some very interesting fluid mechanics phenomena associated with both nutrient flow within the organisms and the mechanism by which spores are released. In regard to the latter, a certain group of fungi (phylum Ascomycota) has a protrusion (called an ascus) that aids in releasing the spores into the free stream, allowing the fungus to spread more readily. Despite large variations in size and environment, these fungi can be shown to share a common scaling by applying a simple force balance on the spore release mechanism (viscous drag on the spore, surface tension, and osmotic pressure to name a few). Why do we care? I have no idea—I didn’t attend the talk. But, it is an interesting reduction of a complex, natural system to a simple physical relationship. Another (somewhat controversial) talk given by John Dabiri from the California Institute of Technology discussed the role of marine life in large scale oceanic mixing. The speaker claimed that marine life (varying in scale from phyto-plankton to blue whales) collectively contributes up to 0.9 terawatts in mixing power. However, the controversy arises from the lack of convincing evidence that small turbulent pockets in the ocean can lead to large scale mixing. The traditional turbulent cascade suggests that injected energy will rapidly diffuse viscously, resulting in very little global flow. That said, it is plausible that such an effect could exist. Why do we care about this? Again, I wasn’t at the talk, but I have heard from other sources that ocean mixing is believed to play a role in climatology. If nothing else, at least this guy got to go out on the ocean to observe natural mixing. It beats going to a swamp to look at slime. The last invited talk that caught my eye was given by Michael Graham from the University of Wisconsin-Madison on the drag reduction limit encountered in bounded flows. It is fairly well known that the injection of trace amounts of very large polymer molecules into oil pipelines can drastically reduce the head loss resulting from turbulence within the pipe. However, it can be seen experimentally that while a little bit is good, and a tad bit more is better, there is a limit at which point adding additional polymers results in no further drag reduction. The exact mechanism for the drag reduction isn’t fully understood, but it believed that the long polymers act to either increase the effective viscosity by coupling the fluid over longer distances than molecular viscosity alone (and thereby reducing turbulent fluctuations), or the polymers serve as small springs that store and release turbulent energy back into the fluid, resulting in less turbulent dissipation. Their direct numerical simulations are shedding some light on this mechanism. This research is of much interest to a wide array of industries, particularly those with long pipelines, i.e. the Alaska pipeline. As this was my first conference to attend as an exhibitor, I was not sure what to expect. However, I greatly enjoyed talking with researchers from a wide array of locations and really appreciated everyone’s time to stop by and talk about Pointwise. To everyone who dropped by to say “Hello,” it was a pleasure meeting you! I found that many attendees run in-house codes. You may be aware, but Pointwise ships with a plugin API that allows users to export their mesh into any desired format. This includes all cell and node data, in addition to the boundary conditions, etc. This functionality is perfect for stand-alone applications where a custom grid format is desired. An example plugin is provided with the documentation for the API. If you are running your own code and need a stand-alone preprocessor, I would encourage you to sign up for a free evaluation license to try Pointwise for yourself. All in all, I had a wonderful time at the conference, even despite its somewhat grueling schedule. I hope to attend next year in San Francisco, where I plan on presenting results regarding the science of grid quality and simulation accuracy. I look forward to seeing you there! This entry was posted in Applications, Events, People & Places and tagged American Physical Society, conference, Fluid dynamics. Bookmark the permalink.